New TE David Thomas had a fantastic career at Texas, and a promising rookie campaign but in April of his first full offseason he suffered a broken foot. He tried to play early in that season but struggled with the injury, never fully recovering and possibly re-injuring the foot, and was placed on injured reserve after a two-catch season. In 2008 he might have permanently worked his way into Belichick's doghouse with this game-damaging, bone-headed play. Thomas has always been a better receiver than blocker, its just that in the Patriots' offense the success went through the runningbacks and receivers. Tight ends were not asked to be a major part of the offense. We will see in New Orleans a David Thomas never seen in New England. Certainly the Saints offense has more gears in it for tight ends than the Patriots. 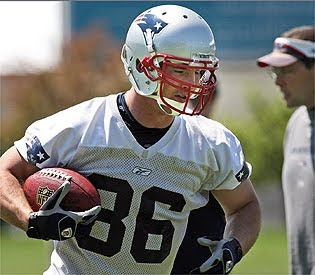 That said, Thomas improved as a blocker in 2008 and coming back from his foot injury showed that he had taken big strides in becoming a more complete tight end. His problem that led to his trade to New Orleans (which pre-empted outright release from the team) was that the Patriots were loaded at tight end: Ben Watson, Chris Baker and Alex Smith were on the roster and the Patriots also traded for Michael Matthews the same day Thomas left. Thomas will likely not contribute, or even be active, right away. The Saints offense is not one easily assimilated. Look for Thomas to be able to contribute to this team if his foot is healthy.